Prevent a plug from being inserted into a wall outlet with a plug lockout device. This type of device is ideal to lockout an electrical plug with a simple solution for your lock out tag out safety program. 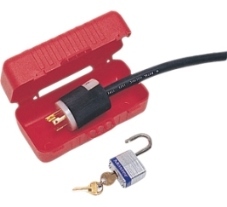 We have various sizes and shapes and sizes that easily lock out plugs safely and quickly. A good safety program includes a variety of lock out tagout products to be sure that your facility is safe from energized energy. If you need help with your purchase, give our safety experts a call or use our online chat.